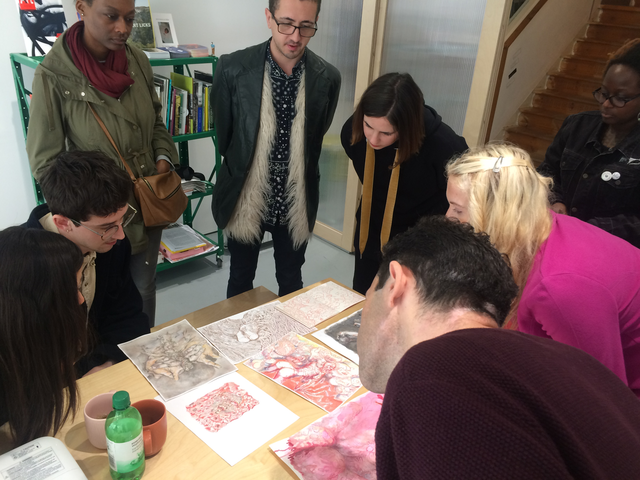 After a quick introduction to each other, four artists presented their work. The rest of the people present were commenting and listening: Nadia Elliott, Justin Harris, Sophia, Harold Robson, Sonia Vivo, Holly Graham and Alice Cretney. The first artist was Miguel Sopena, who presented three paintings that he did during a one month residency in Sofia, Bulgaria. The oil paintings were displayed in a line and they felt like a sequence; from an aerial view, to a landscape, to a microscopical view. They were related to the political and religious history of Bulgaria, depicting a site where the revolution started, the interior of a church, and a close up of an orthodox icon. Tuli Litvak played a film that was the documentation of a performance: GLASS_LIFTS_DANCE. The performance took place in one of Central Saint Martins college’s semi-private / semi-public non-spaces found in the interior of the university. It showed dancers interacting with different physicalities of the glass: a wall of glass cups standing inside the atrium in a precarious balance, alternating with images of dancers leaning their weight, climbing and contorting inside the glass lifts that were in front of glass cup wall. During her crit we found out that she works around things that irritate her, such as the vulnerability felt while walking around those impressive, all glass, interior spaces. I remember during my time at the RCA I thought a lot about these kind of university spaces that are built to impress the visitors, but are of almost no use for the students, who get year after year smaller, increasingly cramped studios for which they have to pay higher tuition fees. After Tuli, Joshua Yates showed a work in progress, a made to measure crate: a device for protection of valuable goods where he could store himself. Upon a first reading, the work seems to allude to current challenges for artists in London – problems of being able to, first produce works, but then store them or ship them. Moving beyond a slapstick comedy reference, we found a hint of absurdity intertwined with social and artworld critique. Both Tuli and Joshua are new graduates, facing all the adversities that an emerging artist meets in a city like London, from high rents to corporate security and H&S regulations. And Last but not least was Yolanda Sheilds, AKA milktooth, who spread a series of highly skilled drawings on paper on the table, displaying her personal universe. The drawings felt intimate, repulsive, hellish and magical, as if they were influenced by the theory of the abject formulated by the psychoanalyst Julia Kristeva. 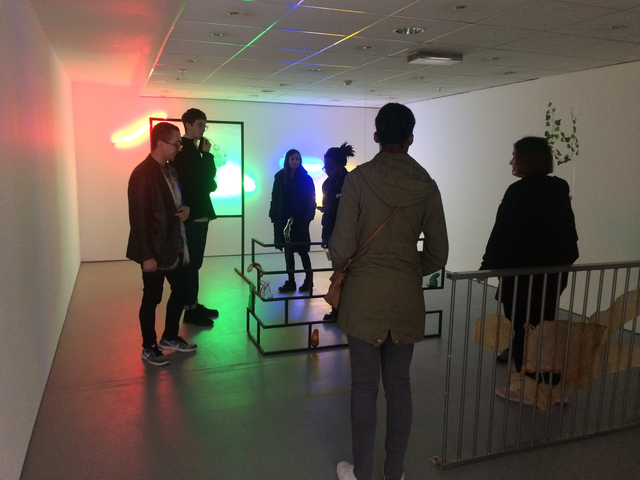 After finishing the crits we did a tour around “Peaks & Troughs” and I was able to answer questions about the show. At the end we exceeded the time, because we were enjoying the discussion. I was really exciting to lead these crits, thank you so much to all the attendees, to Holly Graham for organising it and to Turf Projects for their exciting programme. Personally, I learnt a lot from this crit and I hope those who joined found it as useful and interesting as I did. I think these kind of events are valuable not only for getting, giving or listening to feedback about different works, but also for the human quality of it. Many thanks to Saelia for leading the crit and for this writeup! Turf’s next free crit will be on 25 November, led by artist Anna Reading.